2017 In A Sentence: Though Joe Susan’s Bison were able to engineer some dramatic Patriot League wins, a winning season eluded them with a 5-6 record that was oh-so-close to finishing above .500. Biggest Shoes to Fill: Despite double-teams all year, DT Abdullah Anderson (42 tackles, 9 tackles for loss, 2 fumble recoveries) still cast a long shadow over Patriot League offenses all season. This offseason he was signed by the Chicago Bears. Key Player: RB Chad Freshknock was the team leader last season in rushing yards (525) and all-purpose yards (583), though he was a rotation back. This year he should be more of a feature back in the Bison offense and will look to hit the 1,000 all-purpose yard plateau. 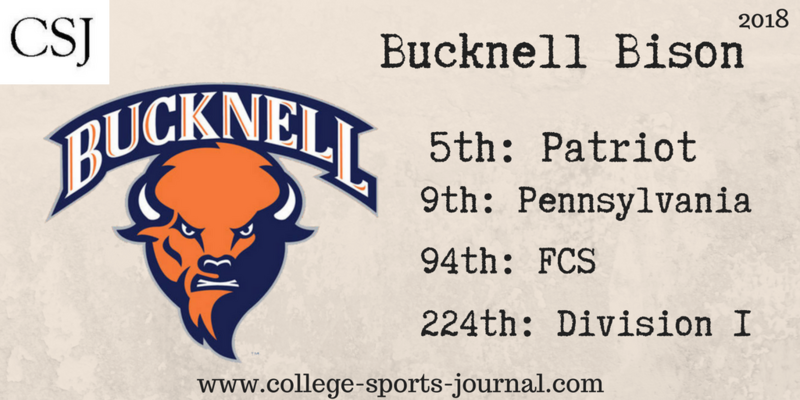 Fearless Prediction: Can the Bison get into the title conversation and finish over .500? To do so they’ll have to navigate a challenging out-of-conference schedule with Penn, Villanova, Monmouth and William and Mary and establish an effective ball-control offense with Freshnock and returning QB John Chiarolanzio. If they can win one of those tough out-of-conference games, that could establish them as title contenders.